If you're looking to choose a new vacuum cleaner you might be somewhat confused by the huge variety of options of on offer: corded versus cordless; bagged versus bagless; upright versus cylinder; lightweight, hand-held, robot, pet-friendly, allergy-friendly... the list goes on. But which is the right vacuum cleaner for you and for your house? In this guide, we whizz you through all the vacuum cleaner buying options to help you make an informed choice. Plus, we'll recommend the best vacuum cleaners at the best prices, too. Use our guide to how to vacuum, too, to pick up tips and advice about how you use different vacuum cleaners. Which is better: upright vacuum cleaner or cylinder vacuum cleaner? Upright vacuum cleaner or cylinder? Browse the pros and cons of each to help you decide. Motorised brush: this cleans carpets better than a head powered by suction alone. A switch to deactivate the brush: this protects hard floors from being scratched and stops dirt scattering. Pile height adjustment control: useful if you go from carpet to shag to rugs. Suction control: for gently cleaning upholstery and curtains. Noise: most full-sized vacuum cleaners have a noise output of 70 to 80 decibels (dB), so look for a model at this level or quieter. Capacity: the larger the dust bag, the better the airflow, and therefore, cleaning ability. Cleaning tools: a good range of tools, including an upholstery and curtain brush, is a must-have. Ensure the profile of your main head is low-profile enough to go beneath furniture, too. 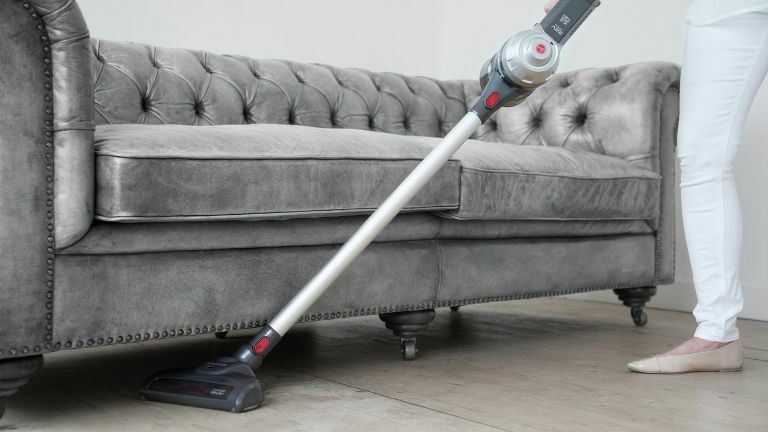 Power: vacuums tend to be rated by different manufacturers in different ways, which makes comparison harder – so always read our vacuum reviews before buying. Easy to store neatly – because of their upright nature. You don't have to bend forwards to clean – useful if you suffer from back pain. They make it easier to clean curtains and upholstery. They're quieter, for the most part, than uprights. They're a pain to store compared to uprights, being bulkier and with a hose/wand that never wants to stay neatly in a cupboard. Which to choose, upright or cylinder? If you have a large house with plenty of carpets, if you have a bad back, and if you have few stairs, invest in an upright. If you have a smaller home, suffer from back pain and have lots of stairs, a cylinder model will suit you better. We scour the deals and bargains every week to bring you the very best prices on your favourite vacuum cleaner brands. The advantages of lightweight vacuum cleaners (above) are all about the ergonomics: they usually have tall bodies and handles, like an upright, but because they don't have the weight of most uprights, they're easier to manoeuvre and you don't have to bend forwards when vacuuming. Pick a model with a powerhead to get the best results. The disadvantages of lightweight vacuum cleaners are that they don't perform as well as full-sized vacuums on carpet, and their canister tends to be quite a bit smaller, meaning you'll have to empty it more often. Cordless models won't offer the power of better corded ones, too. Some are surprisingly noisy, too, so look out for that when buying. Considering a lightweight vacuum cleaner? They're great for convenient, light cleaning but don't expect to use them as a replacement for a conventional vacuum cleaner. The capacity of their dirt bin is typically small. Most are fairly noisy. Our buyer's guide includes all the best-rated lightweight models and our comparison tools allows you to get the best price. The advantages of small vacuum cleaners or handheld vacuum cleaners are that, whether corded or cordless, they're useful for quick, light cleaning of hard floors, upholstery, curtains, worktops and short-pile carpets. They're also useful for vacuuming the interior of your car. The disadvantages are that they won't do a really thorough job on deep pile carpets or over large areas, their canisters need emptying regularly and they're generally not as powerful as their larger counterparts. However, for small homes or as an added extra to the household's main vacuum cleaner, they're a useful tool. We've rounded up the most powerful small vacuum cleaner models to keep your home sparkling. If you're a lover of smart home tech, you'll almost certainly be reading this section carefully. So, what are the advantages of robot vacuum cleaners? Well, robotic vacuums do the vacuuming while you're on the sofa/out/at work/in bed. They're best in uncluttered rooms, where they can work their way around, go beneath furniture and into tight corners. The disadvantages? They're no match for deep cleaning, larger vacuum cleaners and aren't great if you have deep pile carpeting or tons of area rugs. Still interested? Look for a robot vacuum cleaner that can be controlled by an app on your phone; choose a robot vacuum cleaner that can work its way around tricky situations (backing out of corners, finding its way around extension cords) and choose one that's quiet, so that if it's set to do a quick clean downstairs at night you won't be disturbed. Find the best robot vacuum cleaner to tidy up while you're out/lying down. We've found the best models available. Not all standard vacuum cleaners are efficient at picking up pet hair, whether from carpets or furniture. Vacuum cleaners that are designed specifically to pick up pet hair come in all vacuum types – from upright models to cylinder vacs to handheld. Of course, powerful uprights and cylinder models will give you the best results, but some handheld models are particularly useful for picking up pet hair from furniture, for example. What to look for? A powerful, motorised brush head; a HEPA filter; and clean emptying of the canister are all up there. The HEPA filter works by forcing the air sucked in through a fine mesh that traps harmful particles such as pet dander, but also pollen, dust mites, and tobacco smoke. This makes these pet hair vacuum cleaners a really good choice for allergy sufferers, too. If you've got a pet, it's worth investing in a vacuum for pet hair. We've found the very best vacuums for pet owners – at the best prices. Corded or cordless vacuum cleaner: which is best? They come with wall mounts (not always, but shop for one that does for easy storage). They lack the power of better corded models – but if you're looking for a cordless vacuum cleaner to do a particular task (ie, clean out the car, pick up crumbs from worktops, vacuum stairs as a supplement to your larger, upright model), it's likely your cordless model will manage the task with ease. Whether you live in a small home and just need to light-clean those wood floors or want to supplement your main vacuum cleaner with a lightweight or handheld cordless, find the best here. Bagged or bagless vacuum cleaner: which is best? Bagged vacuum cleaners are easy and clean to empty, and hold more dirt than bagless cleaners. Bagged vacuum cleaners are recommended for allergy sufferers and pet owners. However, the cost of the bags does add to the cost of your vacuum cleaner over time. And, unless your vacuum cleaner has a 'bag full' alert, you'll only know it's time to change the bag when the vacuum cleaner begins to pick up poorly. Bagless vacuum cleaners can be messier to empty, so check that you're buying one with a dirt eject mode that's been designed to prevent dust escaping, especially if you're an allergy sufferer. On the upside, the see-through nature of these vacs means it's easy to know when to empty them. They're more eco-friendly than bagged vacs, since you don't have to throw away the bags when they're full. However, bagless vacuum cleaners do need their filters cleaned or replaced more often than bagged models; replacement filters are significantly more expensive than replacement bags, so it's worth looking after the filter exactly as the manufacturer recommends.